Trevor Lewis notched his first two goals of the season for the Kings on Thursday night. ST. LOUIS — Just like the last two postseasons, Jonathan Quick had the St. Louis Blues’ number all night. "He was good," St. Louis forward T.J. Oshie said. "It seems like he’s always good." In addition to air-tight goaltending, the Los Angeles Kings also got something unexpected. Trevor Lewis scored his first two goals of the season early in the third period to key a 4-1 victory on Thursday night. "We have developed a little bit of a rivalry over the last couple years," Quick said. "But at the end of the day it counts as two points. "You don’t get extra points because it’s St. Louis." Jake Muzzin scored in the first period and Jeff Carter added an empty-netter for the Kings, who snapped a five-game road losing streak in the opener of a five-game trip. Quick had 28 saves as Los Angeles improved to 16-4 in their last 20 meetings with St. Louis, including a pair of playoff series wins the last two seasons. 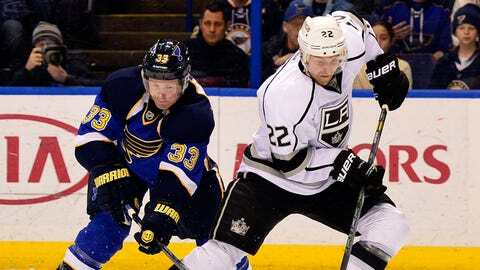 In 2012, the Kings swept the Blues in the second round en route to the franchise’s first Stanley Cup and they took four straight after spotting St. Louis two wins in the first round last spring. "They were much better than us," Blues coach Ken Hitchcock said. "Depends on what we do with it. I’m kind of getting sick of watching it." Oshie scored his first career goal on a penalty shot in the second period for the Blues, who snapped a five-game home winning streak. Oshie has 11 goals on the season and has five goals and four assists in his last six home games. The Blues dropped to 18-4-2 at home and lost for just the second time in 10 games. Lewis scored the tiebreaker at 2:04 of the third, just 4 seconds after the Blues killed off Ryan Reaves’ roughing penalty resulting from a large scrum at the end of the second. Lewis’ shot from the right boards was stopped by Halak but the rebound deflected into the net off the skate of Blues forward Jaden Schwartz. Lewis then got his second goal of the season on a short-handed wraparound at 4:21, capitalizing on goalie Jaroslav Halak’s stick-handling goof to make it 3-1. Halak couldn’t get the puck away from the boards, then didn’t want to play it inside the trapezoid for fear of a two-minute penalty and also thought a defenseman had the net covered. "I’ll take the blame for this one," Halak said. "We lost because of me." Lewis was the Kings’ first-round pick in 2006 but entered with one assist in 38 games and had only five goals last season, the last March 28 at St. Louis. He got multiple points for the first time since March 16 when he had two assists against the Sharks. "He does all the details within our game, within our system," linemate Jarret Stoll said. "A lot of stuff doesn’t get noticed when you’re writing articles or seeing us on TV. "He’s a great teammate so it’s good to see him get rewarded." Oshie has been the Blues’ best in shootouts, going 4 for 6 this season with a variety of jukes and changes of speed. After getting pulled down by Muzzin on a breakaway, Oshie dispensed with the fakery and drilled a shot between Quick’s pads to tie it at 1 at 5:55 of the second. "I think the last time I went in on him I deked to my forehand," Oshie said. "I was hoping he was expecting me to do another deke or something fancy and fortunately I squeaked it between his legs." Oshie’s 11th of the season also gave him the Blues’ last three goals. The Kings scored on their first shot with Muzzin getting his third of the season past a well-screened Halak at 2:31, and carried play most of the first period. Justin Williams hit the goal post on a power play just past the mid-point. NOTES: The Blues are 2 for 2 on penalty shots this season, with Alexander Steen connecting against Florida on Oct. 5 and have made their last four overall. … Muzzin was scoreless and minus-2 the previous 14 games. … Oshie has five goals and four assists his last six games at home. … The game drew standing room attendance of 19,374.